According to Wikipedia: "The red panda was recognized as the state animal of Sikkim, India in the early 1990s, and was the mascot of the Darjeeling Tea Festival." They are also found in Myanmar and Nepal. They reside in these Asian countries where there are bamboo forests, because bamboo is their primary food. This makes it a herbivor. This situation is important because the species depends on bamboo for survival. 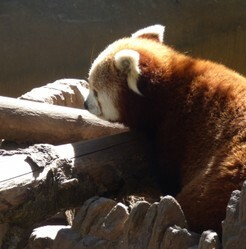 Both the Giant Panda and the Red Panda eat primarily bamboo. Another name for the Red Panda is "fire fox" or also the "lesser panda". At one time the Giant Panda and the Red Panda were both in the same classification, but now the Red Panda has its own classification and it is the ONLY species in the class. Whenever there is only one species in a class they could be in danger of extinction. See more below. Introductory photo was taken by me at the San Diego Zoo. The newest red panda at the Denver Zoo is named Hamlet and he arrived in Denver on February 14. Hamlet is a young male who was born in July 2013. The zoo is hoping to bring a female to breed him with soon. He is getting settled and you can now see him on exhibit so come on by and get acquainted with him. I'm going to the Zoo next week and will try to get a photo of Hamlet then. 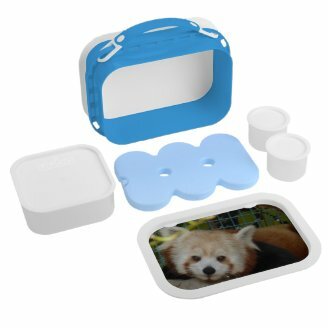 Would the Kids Like a Red Panda Lunchbox? The Red Panda is most active during twilight hours – that’s known as Crepuscular. They prefer temperatures in the 60s and 70s – if hotter they go in to a cave. The Red Panda looks a little like a raccoon because of its facial markings. It is approximately 10 pounds when grown, give or take. That’s about the size of a large cat. Also, like the cat, they have partially retractable claws. I think these little charmers are very cute! They have a thick coat of fur and a long fluffy tail with red and yellow rings on it. They blend into the trees they live in and are hard to see, also they are nocturnal which protects them in the dark. They sleep during the day. Their teeth are perfectly designed for eating bamboo, very sharp. Their feet point in so that it is easy for them to wrap their arms around a tree. They display a “false thumb” – a part of their wrist which helps them to grasp things.When in zoos they will eat other things as well as bamboo such as apples and vegetables, If they don’t eat a lot of bamboo they run low on energy easily. Predators include the marten and the snow leopard. The female red panda usually bears only two cubs at a time and her reproductive cycle is long, therefore their survival is in question. If they lose a lot of population it would be difficult to replenish the species. At this time quite a few red pandas are bred and reared in zoos and these zoos work with conservation ecologists to sometimes re-introduce these pandas into the wild again. Rusty the National Zoo's Red Panda escaped and was found again in June 23-24th, 2013. Have you ever seen a Red Panda? Yes I agree. Thanks for your visit. Great to know that these cute red pandas are from India. Well, there is always something new to learn. Sikkim is very beautiful and hopefully there are places reserved for these beautiful creatures. Glad you were able to learn something new. These pandas are so wonderful, hope you get to see one soon. They are sweet aren't they? Thanks for the visit. I never even knew there were red pandas. I did know that bamboo was the only food giant pandas ate.